The flurry of activity we saw in the first 48 hours of free agency was certainly entertaining for CFL fans. Some teams went all in to take advantage of the largest player pool to select from in many years, while some chose to what they considered to be their own key players and pick and choose from the pool to plug certain needs for their team. Mark Fulton is a numbers guy and former analytics blogger for 3DownNation.com. 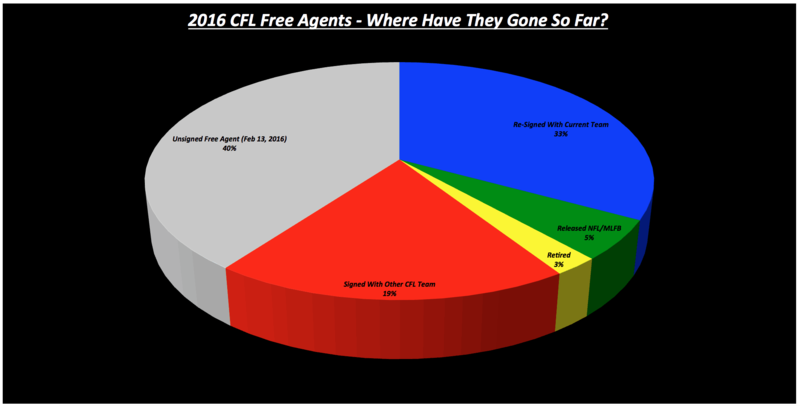 He’s produced some informative charts to show the trends of CFL Free Agency. Mark shared these charts with us and there are some interesting observations to be made when you look across the league. In his chart, Mark has been able to show the flurry of activity that surrounded the start of free agency. With teams signing their own players ahead of free agency, you see the graph show a slow steady decline in the number of free agents, before the gloves came off on February 9th. Here we see the breakdown of each teams make-up when it comes to gains and losses. Both Hamilton and Toronto lost 8 players to other teams and you can see by the chart that Hamilton, Saskatchewan and Toronto still have a large number of free agents unsigned, which doesn’t necessarily mean they are trying to do so. All teams re-signed key players, with Winnipeg only choosing to keep 3 of its 8 available players. 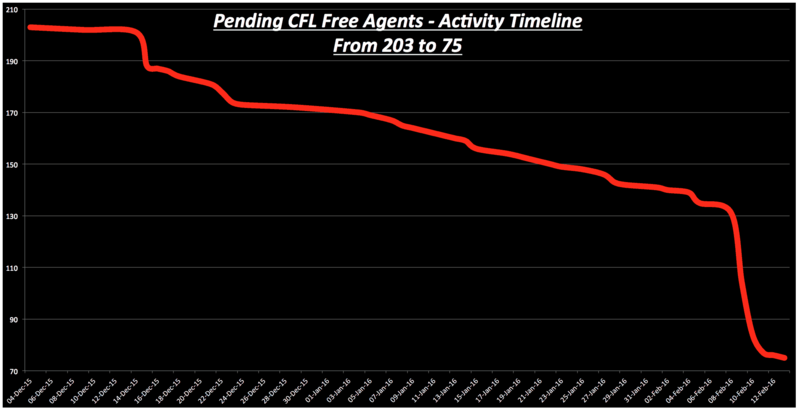 Overall as of February 13th, 40% of the CFL’s eligible free agents remain unsigned, meaning we are likely to see a few more signings over the next few weeks. Many teams are about to embark on free agent camp circuits and may come back to pick through the pile if they still have holes to fill heading into training camp. 33% of players re-signed with the current teams, while 19% have a new home heading into 2016. Standing out in this chart is the fact that Hamilton and Saskatchewan’s current roster is only made up of 44% and 47% of existing players. They both have the highest percentage of remaining unsigned players, while Hamilton tied Toronto by losing 11% of the players to other CFL teams. 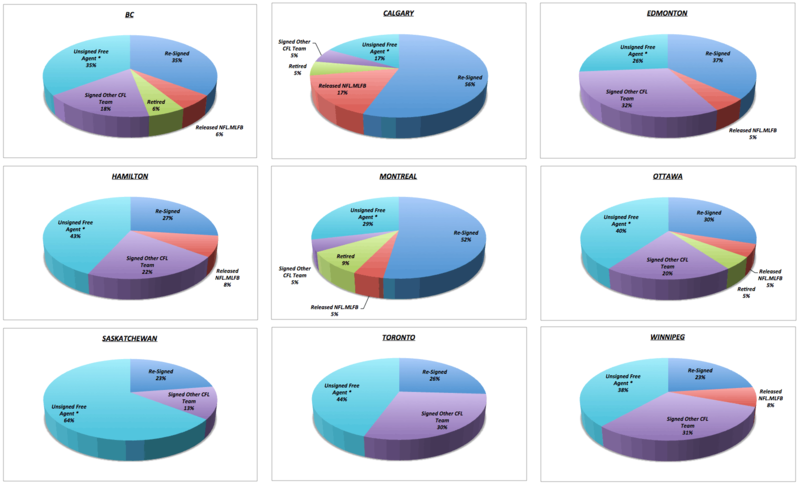 Finally, each team is broken down into pie charts.